While hot potato chips aren't the healthiest snack you could select during pregnancy, eating them is unlikely to cause any harm to you or your unborn baby. If you are eating an otherwise healthy and well-balanced diet, indulging in this snack occasionally is perfectly acceptable. However, depending on how far along you are in the pregnancy, the chips may produce several different physical reactions in your body. More than half of all women who are pregnant experience morning sickness, especially during the first trimester, according to the American Pregnancy Association. Morning sickness is characterized by feelings of nausea and can occur with or without vomiting. You may find that certain foods ease morning sickness, while other foods tend to trigger it. Since every pregnant woman is different, it is impossible to say with certainly how eating hot potato chips will impact your feelings of morning sickness. The American Pregnancy Association notes that salty potato chips may settle your stomach long enough for you to eat a meal. At the same time, foods high in fat, like hot chips, may also exacerbate feelings of nausea. If you find your morning sickness gets worse after eating hot chips, it may be best to limit your consumption of them until later on in your pregnancy, when your morning sickness has passed. During the second half of pregnancy, you may suffer from heartburn, due to the extra progesterone in your body relaxing your muscles, including the valve that separates your esophagus from your stomach. As your baby grows, it can push your abdominal cavity, so stomach acids go back up into your esophagus. Foods that are spicy, fatty or highly seasoned, such as hot potato chips, often trigger heartburn. Spicy and fatty foods, like hot chips, can exacerbate these symptoms. Taking an over-the-counter antacid, remaining upright after eating and avoiding overeating can help reduce these symptoms, but some women may need to avoid foods that trigger heartburn. If you find yourself plagued with heartburn after eating hot chips, you may need to refrain from eating them until after the baby is born. 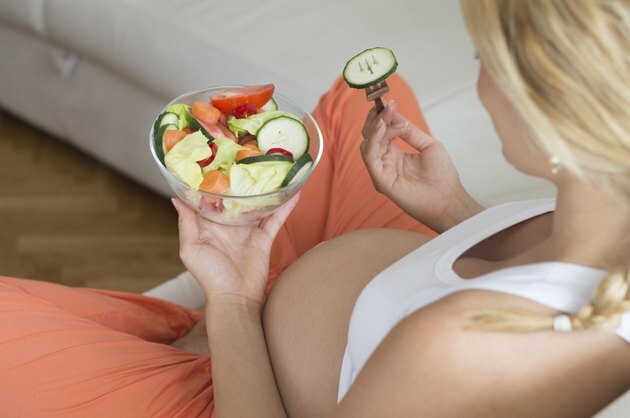 Getting proper nutrition is essential to the proper development of your unborn baby. Most hot chips contain a significant amount of calories, total fat, saturated fat and sodium. However, some may offer small amounts of fiber, protein, vitamins or minerals as well. When determining whether or not you should consume hot chips, consider your typical eating habits. If you have unhealthy eating habits and struggle to meet your recommended dietary allowances, opt to eat a healthier snack instead. Always check the nutrition labels carefully if you have any type of food allergy or sensitivity. Eating a food you are allergic to during pregnancy not only puts you at risk, but puts your unborn baby at risk as well. If you have specific questions or concerns about the safety of a certain food, call your health care provider.